In the near future, we will start reviewing books relating to local history on this blog. We know that there are a lot of interesting titles out there that haven't received the exposure they deserve. 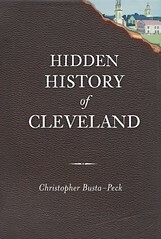 If you have a book that you would like to send us a copy of, contact us at clevelandareahistory@gmail.com for our mailing address. Receipt of a book does not guarantee a review, nor can we promise that you will like what we have to say. That said, we'd like to start sharing some local books. Please, send them our way!